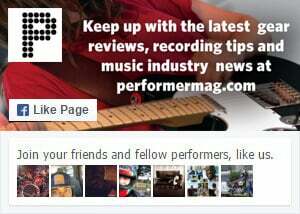 Audio-Technica and Performer Magazine team up to provide practical how-to information on recording overheads drums, ride cymbals and hi-hats. Welcome to the third in a four-part series that will provide real-world advice for setting up your home recording studio to record a full drum kit, co-presented by Performer Magazine and Audio-Technica. In this installment, we’ll take a closer look at the best techniques for recording cymbals, hi-hats and overhead miking during your sessions. In additional installments, we’ll go into more detail about specific drum recording and even adding effects like reverb, delay, room ambience and gating to your mix. One practical reason professionals will place a pair of overhead mics above a drum set, either during tracking sessions or live gigs, is to capture a stereo image of the full kit, that can then be panned to left and right speakers in the mix. This aids in capturing the “fullness” of the entire drum set, which can be further complemented by individual miking on snares, toms, cymbals, etc. Our friends at Audio-Technica have a few handy tips for overhead miking techniques. Dual, Spaced-Apart Cardioid Condensers. Combining a set of AT4050’s above your kit gives you some options for capturing the stereo image in an easily adjustable manner. Keeping both mics the same distance from the snare will be key, but you can experiment with overall height to play with the balance of the sound, and can position the mics closer or farther apart from one another to affect the overall stereo imaging. More distance usually equates to a wider image, all things being equal. An X-Y Overhead Setup. Alternatively, you could try an X-Y configuration with your overhead mic setup. Use two cardioid condensers with the elements as tightly together as you can get them at a 90-degree angle. Keeping this arrangement centered above the snare will help keep it (the snare, that is) focused in your stereo image, and making sure the entire configuration is high enough will eliminate most phase issues that can arise from splashy cymbals passing through the field. ORTF. See the video for a more complete visual representation of this configuration. Similar to the set up above, you’ll use a pair of cardioid condenser mics, this time spaced slightly apart and not at a 90-degree angle like the X-Y configuration, but rather at a 110-degree angle from one another. Positioning. If you place the mic on the outside edge of the hi-hat, you kill two birds with one stone. For starters, you’ll be keeping the mic out of the way of the drummer, which is always a good thing. And second, you’ll help isolate the hi-hat from the rest of the kit, which can be helpful to either eliminate bleed and/or raise/lower the hi-hats themselves in the overall mix, independently of the overall balance. This might seem like a no-brainer, but make sure the mike is positioned high enough above the hi-hats so as not to interfere with the opening and closing. You’d be surprised how many times we see mics placed too close to unopened hi-hats at live gigs, only to be knocked over the second the drummer starts using the pedal to open and close them. Oops! Something that can easily be avoided. The closer your mic is to the bell, the more focused the sound will be. That goes for live and studio situations. If you are placing the mic on the outside edge of your hi-hats, experiment with non-parallel positioning. When you close the hi-hats using the foot pedal, there’s a lot of air being pushed around, and a big attack like that can spike or possibly damage fragile diaphragms, especially in smaller condenser mics. And lastly, we’ll close out this installment with a few more practical techniques for miking your ride cymbals, again courtesy of our friends at Audio-Technica. Positioning/Placement. Like most parts of the kit, you’ll want to place the mic close to the source to eliminate bleed; just be careful with the ride because a mic positioned to close to the cymbal can add unwanted low-end boom that will muddy up a mix. Typically, you’ll want to accentuate the percussive nature of the cymbal, so placing the mic about halfway between the edge of the cymbal and the bell can aid in this goal. Keep in mind your overheads will pick up a lot of the slack when it comes to low-end fullness, so focus on capturing the attack for elements like the ride. Stereo Imaging. Stereo placement is crucial to a great drum mix. Phil Spector might not agree, but hey, it’s not the ’60s anymore. Placing the elements of your kit properly in the left, right and (phantom) center channels will make the drums sit well amongst the rest of your mix, and will spread out and “de-congest” the overall balance of the track, as opposed to drums that are centered down the middle with no thought to proper spatial placement and panning. In short, once you find the right placement of the ride mic, use it to complement your overheads in the mix, and experiment with panning the ride individually to see where that attack sits best in your overall drum mix. Now, keep in mind this is simply a primer to get you thinking about how to record drums in your studio. We hope this installment provides some helpful tips when it comes to miking up your overheads and cymbals for your next session. In additional installments, we’ll tackle the rest of the kit plus effects, so stay tuned (no pun intended). Until then, be sure to check out the entire range of Audio-Technica instrument microphones here and follow Audio-Technica on Facebook, Twitter and YouTube.